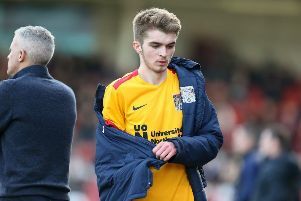 Cobblers defender Ash Taylor admitted Tuesday’s win against Tranmere Rovers tasted extra special due to his long-standing affiliation with the Prenton Park outfit. Taylor was only 10 years old when he started out as a youth player at Tranmere before he graduated all the way through the youth ranks and into the first-team. He went on to make 203 senior appearances for Rovers between 2009 and 2014. After then moving north of the border to spend three years at Aberdeen, Taylor joined the Cobblers 18 months ago. And he was part of one of their best and most important wins during that period as Town toughed it out against his former club on Tuesday, winning 2-1 courtesy of two first-half goals from Sam Hoskins. “It makes it a little bit sweeter,” he admitted. “I was getting a bit of stick during the game which I don’t mind, but I’m a local lad and played for the game so it does feel a bit better. “I knew I’d get a bit more stick if we didn’t win so it was nice to get the points. I had a few friends and family here. My cousins and my brother and a few others came to the ground. We were more robust on Tuesday and kept our shape and distances between us all a lot better and that showed in the overall performance. Town’s back three turned in one of their most resilient performances of the season at Prenton Park as Taylor combined with fellow centre-backs Charlie Goode and Aaron Pierre to withstand oodles of Tranmere pressure to protect the victory. “As a squad we needed that,” said Taylor. “I thought it was the perfect away performance because we soaked up pressure and then hit them on the break. “They were scared of Sam with his pace and he made them work really hard and got his two goals. “We’ve discussed it in the week about being ruthless in front of goal and taking our chances and Sam was on Tuesday. He had three chances and took two of them and that’s all you can ask for. “We managed the game well and we had our distances right tonight. The first-half we were adjusting to it because they had a lot of the ball but we rectified that in the second-half. “When we’ve played three at the back at times we’ve been a bit too expansive and that’s just down to personnel and the way we’ve gone about things. “We were more robust on Tuesday and kept our shape and distances between us all a lot better and that showed in the overall performance. The three points at Prenton Park moved Town 10 clear of the drop zone and eased fears of being sucked into a relegation battle this season. “I wouldn’t say it’s relief,” continued Taylor. “We believe in ourselves in a squad and we believe we won’t be in much danger when we put in performances like that. We know we’re capable of it.